Boulder, Colorado – Nicole Brusewitz, Vice President of Education and Events at the Mountain West Credit Union Association, has been selected as the first winner of the Global Women’s Leadership Network “Emerging Leader” award which recognizes the accomplishments of an up-and-coming female leader working in the U.S. credit union movement. 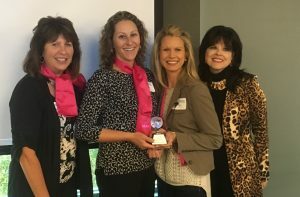 Nicole Brusewitz, Vice President of Education and Events at the Mountain West Credit Union Association, receiving the first ever Emerging Leader Award awarded by the Global Women’s Leadership Network. Pictured from left-to-right Nancy Herbert, Nicole Brusewitz, Calyn Ostrowski, and Sara Canepa Bang. Since joining the credit union industry in 2007, Nicole Brusewitz has aligned her daily activities to strengthen the associations’ employees and members; and through her leadership, established a Global Women’s Sister Society in the Mountain West region that has equipped hundreds of credit union women with actionable steps for navigating their professional journeys and making the credit union industry stronger. The inaugural award is sponsored by CO-OP Financial Services in recognition of recently retired CEO, Stan Hollen, who made a lasting impact on the credit union movement by personally promoting, mentoring, and inspiring dozens of young women and men. “Stan’s devotion to developing female leaders is evident in the lives he changed. In 2009, he became one of the founding contributors of World Council’s Global Women’s program, and through CO-OP’s continual support, has advanced the leadership capacity of thousands of women worldwide,” said Calyn Ostrowski, executive director of the Worldwide Foundation for Credit Unions and Global Women’s Leadership Network. The Global Women’s Network has become the premier international platform for advancing women in leadership positions and increasing women’s access to credit union services. “Nicole’s accomplishments are impressive and have a ‘pay it forward’ quality that we at CO-OP Financial Services try to emulate in our efforts. To have her as the first winner of this prestigious award sets the tone for all future recipients,” said Sarah Canepa Bang, Executive Vice President, Industry Relations at CO-OP Financial Services. Unlocking the leadership potential of up-and-coming leaders is critical to the competitive advantage and long-term sustainability of credit unions. Research by Filene and World Council found five major challenges precluding women from reaching executive status, including the “pipeline problem” which shows women are more likely to begin working in low-level credit union positions and—despite similar stated ambition—are less likely than men to achieve executive-level status. “We know credit unions will only realize their full potential when they bring the distinctive vision that women leaders offer to transformative outcomes. Targeting the leadership potential of up-and-coming talent can shorten developmental milestones and expedite top performers’ readiness for advancement,” said Ostrowski. World Council of Credit Unions is the global trade association and development agency for credit unions. World Council promotes the sustainable development of credit unions and other financial cooperatives around the world to empower people through access to high quality and affordable financial services. World Council advocates on behalf of the global credit union system before international organizations and works with national governments to improve legislation and regulation. Its technical assistance programs introduce new tools and technologies to strengthen credit unions’ financial performance and increase their outreach. World Council has implemented more than 290 technical assistance programs in 71 countries. Worldwide, 57,000 credit unions in 105 countries serve 217 million people. Learn more about World Council’s impact around the world at www.woccu.org.